Connecting you to a deeper place in your life. Art inspires, art empowers, art lifts us up, leaves us with emotions that make us feel alive! The Divine Goddess lives in all women. This 2-part commission was created to energize the soul, evoking a sultry combination of Greek and Arabic-dance elements. "Aphrodite" and "Persephone" were born. Looking for a beauty that could vibe uplifting feelings, this client was inspired by how much Arabic dance transported her to a a world of light and peace. Fiery and passionate, this bold mix of Gitana and Arabic Dancer was this client's inspiration. One look at this mamacita and the bravery to take on the day fills your soul. 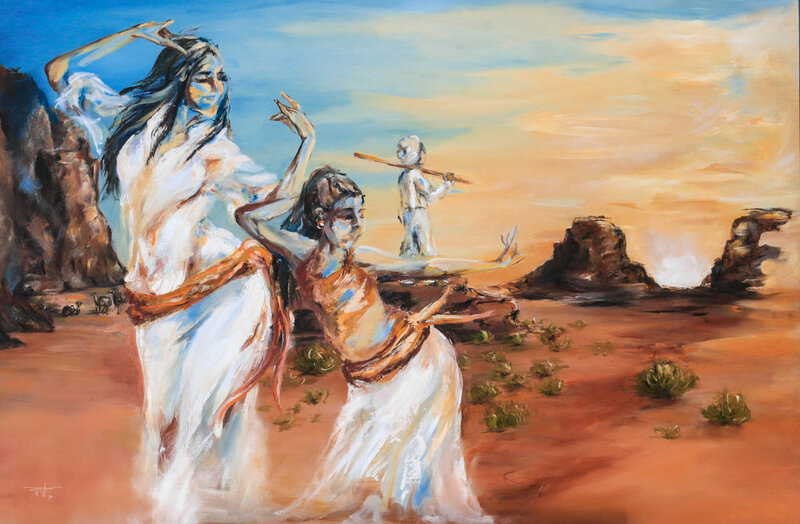 Inspired by the Wadi Rum desert in Jordan, this painting was created for a dance mom and her daughter and son. Wadi Rum was a place she traveled to and loved how peaceful and happy it made her feel looking out at the beauty of nature. This unique commission was designed for a couple (a belly dancer and her husband)who wanted to bring their personalities into one painting. Located in a special place in their home, this painting was intended to inspire strength, confidence and bring light into their hearts. Working with you will be a pleasure! Help me get to know you better and our process will be a breeze. Your privacy is important and no information will be made public without consent from the client. Step 1: Before we meet, ask yourself the following questions. **Answering even just one of the questions will help guide our discussion and creation of the painting(s). The final piece will be the essence of what I'll gather from our conversation.  While dancing, which movements do you feel most confident with and/or what area(s) of your body?  Is there a story that you wish to tell, or a song that you love that you would like to incorporate into the creation of your piece?  Do you have favorite artists or dancers? Which ones and why?  What colors do you envision your painting to have and for what reason? For example: "Orange" because it motivates me, "Blue" because it calms me.  Are there any special requests that you would like to add to the creation of the painting? Discussion about your vision and what I can do for you. Decision time! We will look at sketches and options to complete our decision as well as the deposit. Deposit (40%) will be due in cash, check or credit card. Full payment is optional. Depending on the project, I estimate 2-4 months of completion in which I will contact you on my progress.